Tender, butterfly shrimp are stuffed with real cheese blends and coated with flavorful breadings for an irresistible combination of taste and texture. Easy to prepare and impressive on the plate. KEEP FROZEN UNTIL READY TO USE – DO NOT REFREEZEIn deep fryer, heat oil to 350°F. 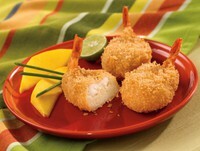 Add stuffed shrimp, shaking baskets to prevent shrimp from adhering. Fry for 4 ½ - 5 minutes.